ZEV ELECTRIC motorcycle has incorporated its new “Electronic Transmission” into all of its high power electric motor scooters. The Electronic Transmission is a special form of electronic controller for the high power ZEV Ebikes that allows the rider to independently vary both the voltage and the amperage of the current sent to the hub motors at the same time. This allows the rider to obtain the maximum range by keeping the power consumption as low as possible at any given speed or load. The Electronic Transmission allows the rider to “shift” so that just like a mechanical transmission, the rider can shift to a high rpm (high voltage), low torque (low amp) setting for cruising, or a high voltage, high amp setting for high loads and hills or maximum speed. The throttle controls the voltage; the Electronic Transmission shift button controls the amperage setting. Each touch of the button reduces amps by 20 (always leaving 20 at the bottom level). As an example - the 100 amp X 72 volts maximum power controller would have 100, 80, 60, 40, and 20 amp settings. To make sure that the new controllers would stand the rigors of the high power bikes, the controllers were tested in a hot box where they were ran at full power, full load for 48 hours at 115 degrees F/45 degrees C ambient air without shut down. Given that the actual installation on the bikes allows for air flow over the deep cooling fins, the test was a bit of overkill. The ZEV line of electric motor scooters are the fastest and the longest range electric scooters in the world at this time –with the help of the energy saving Electronic Transmission. In operation the rider has a shift button next to the throttle. Once the rider reaches the desired speed, he can touch the button to “shift” down the amp flow, reducing torque, until the bike will only pull the speed desired by the rider. Additionally, regenerative braking is built into all ZEV controllers and bikes so that the bike recharges the battery during braking as it switches the motor into generator mode. Regenerative braking is of little help on flat land or where the brake is seldom used. However, in very hilly and curvy terrain it is of great help, extending the range 15% to 18% depending upon the bike/road/load/speeds. With the maximum battery capacity in excess of 5.5 Kwh on some models and the help of the Electronic Transmission, the bikes range in the largest battery capacity has reached 160 Km/100 miles in testing. That same bike can exceed 120 kph / 75 mph. You can see more details of the system and the various models at www.zelectricvehicle.com. All ZEV bikes qualify for the 10% Federal tax credit for electric bikes. This is really very innovative idea... electric motorbike stands for fuel efficiency which comes with reduction of air and sound pollution. Electric motor bike are true example of Eco friendly bikes. Wonderful blog!! The ZEV line of electric scooters are the fastest and the longest range electric scooters in the world at this time –with the help of the energy saving Electronic Transmission. I like to read this blog. It is very informative and impressive. Thank you so much for sharing this very great blog. Please feel free to leave your comments or suggestions! We welcome all input. 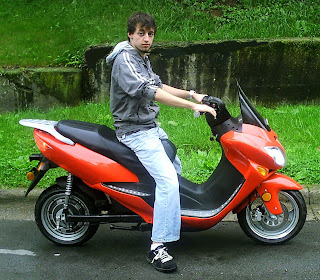 Buy an electric motorcycle now! Save money on gas. Buy an electric motorbike! Good for your pocket book for everyday savings and the good for the environment too. Create Custom T-Shirts Online and Sell them too!